A nice example of a Hunter cased pocket compass signed NEGRETTI & ZAMBRA LONDON, inside the lid, which dates to the early part of the 20th century, and is contained inside a Dennsion nickel case that has matching serial numbers on lid and base. Fitted with an English cross bar needle that pivots on an agate gemstone, above an attractive frosted aluminium dial on which is printed 'ENGLAND'. A super compass measuring 45mm in case diameter, it's in good working order including the lid activated transit lock, and the clean bevelled glass crystal is chip free. In excellent condition all round with no dents on the case, a very collectable compass. A rare floating dial design mahogany cased Mariners pocket compass measuring just over 76mm square by 28mm deep. The attractive paper compass dial card is of an earlier Regency design and in surprisingly clean condition. Dating to circa1840 with cleverly concealed hinges, this is a clean compass which is well over 170 years old. In good condition and in full working order, including the original transit lock, a nice example of an early antique compass. This impressive English surveyors compass was made sometime at the beginning of the 19th century and is signed 'Dollond London' on the dial, which has a stepped outer scale engraved 0-360 degrees in one degree increments. The cross bar needle pivots on a gemstone bearing above the silvered dial under a clean, chip free glass crystal, and also has a lid activated transit lock. A substantial quality compass example it measures 150mm x 150mm x 29mm, with a dial diameter of 125mm, and weighs just under 700 grams. The cosmetic condition of the dial is excellent and although the mahogany case lid has had some restoration with a narrow piece replaced around one part of the hinge area (see photos), the overall appearance is still very good as can be seen from the photos. A near 200 year old antique compass in good working order. This elegant brass cased explorer’s style compass with a separate push fit lid dates to the second half of the 19th century. It's an unsigned example and has a stylish blued steel directional needle engraved N & S in gold lettering which pivots on a brass capped bearing above a traditional dial, denoting 32 cardinal and inter cardinal points under a clean undamaged crystal. In working order and measuring 55mm in diameter, the brass case is free of any dents as is the matching original lid and comes with a modern velvet drawstring pouch for added protection. 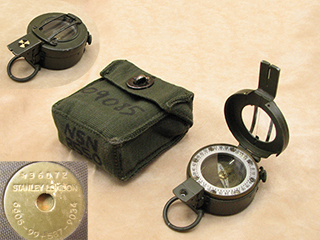 A Stanley G150 mils version liquid filled prismatic compass, first used by the British Army in the Falklands conflict, and again in the first Gulf war. This particular compass is in good condition with some paint loss on the brass body, and also has the Nato stock number 6605-99-537-9034 on the underside with the serial number of 36072. This is a serious compass designed in the 1970's which ceased production under the Stanley name in the late 1990's, and is fast becoming a much sought after collectable. In good working order it comes in a green pattern 58 canvas carry pouch and although the tritium lights are no longer active, it's still a robust precision compass with no air bubbles in the fluid. The majority of MK V pocket compasses were made during the WW1 period up to 1917 when they were superceded by the MK VI version. This particular example is quite rare as not only does it date from 1910 with a very low serial number, but it also has the earlier card dial as opposed to the more common aluminium ones found in the majority. Made by Short & Mason and engraved on the lid 'Short & Mason Ltd, London, V, 1910, 2077', it also has the military arrow, showing that it was issued into service. The nickel plated hunter case is in very good condition with no plating loss and is free of any dents. It has a bevelled glass crystal covering the distinctive Singers patent black & white floating dial, which is mounted on a jewelled brass bearing for reduced friction on the pivot point. In full working order, with a strong hinge, it measures 45mm in diameter, not including the stem. This is an impressive 19th century Georgian mahogany cased pocket compass measuring 67mm square. The attractive paper compass dial is graduated in 90 degree quadrants and dates to circa 1830. Complimented by the small triangular hand made hinges and an elegant blued steel needle, this is a stylish antique compass which is approaching 200 years old. Aside from some fading of the letters N & S on the needle, it is uncommon to find compasses of this age in such good condition, and it is in full working order including the original transit lock activated by lid closure. Engraved 'PARRY & CO', this is an impressive 19th century hand held floating dial compass and comes with its original push on protective brass lid. Parry & Co worked from 158 High Holborn but also made instruments for export and this particular compass was made for the French market. The card dial pivots on a cone shaped brass bearing, and has French compass points with the letter O for West (Ouest), with a black star indicating North. Housed in a brass drum under a clean crystal it measures 80mm in diameter by 45mm high and although it is in working order it is a little sluggish in finding North. A nice example of a late Victorian mahogany cased pocket compass measuring 75mm square with a decorative paper dial, it dates to the last quarter of the 19th century. Fastened with a 7 shaped brass clasp, the paper compass rose has 32 cardinal & intercardinal points with a fleur de lys for North, and is in clean condition. The slim but elegant steel needle is impressed with 'N' for clarity, and pivots on a brass capped bearing under the original glass crystal. A genuine antique compass in good cosmetic condition, it's in working order including a transit lock activated by lid closure. This is an impressive desk top compass measuring 6.5" in diameter, and made by Francis Barker & Son carrying their small but familiar Trade Mark London, arranged in a triangle with an inset logo reading B&S. The attractive paper dial is in complete condition but with a small stained area and is set under a jewelled steel needle measuring nearly 4.5" in length, the glass crystal is also original and in excellent condition. Dating to around 1890, this mahogany cased compass was probably intended for use as an interesting desk ornament, a purpose it would still fulfil today, particularly on an executive's desk. In full working order, it finds North easily and settles quckly, a quite splendid Victorian compass with rare novelty value. 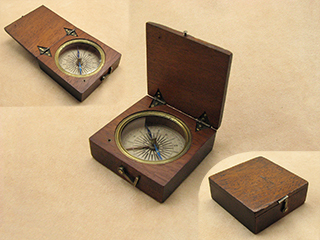 A Georgian pocket compass set in a mahogany block measuring 53mm square, with an elegant blued steel needle over a traditional paper dial. The lid is attached to the body with two small hand made triangular hinges & fastened with a 7 shaped brass clasp. Dating to the first quarter of the 19th century, the paper compass rose is divided into four 90 degree quadrants with 16 cardinal and intercardinal points. The steel needle is also engraved with 'N' & 'S' gilt letters for clarity, and sits under the original glass crystal which is free of any damage. In good working order including a transit lock activated by lid closure. 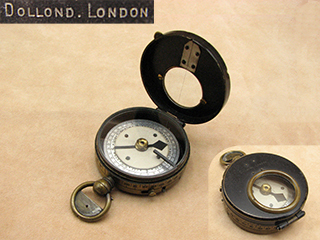 Dating to the end of the 19th century, this Dollond compass is very similar to the Verners MK III patterns. It's a non prismatic model, and the white compass card is surrounded by a silvered bearing ring with a brass manual stop & finger brake on one side. In full working order, it measures 2" in diameter and is in good cosmetic condition, with a chip free crystal. Signed 'DOLLOND LONDON' on the lid. This unusual compass with foldable sight vanes is set in a very attractive mahogany case, and fastened by twin brass clasps. The English cross bar needle pivots over a traditional paper dial which has 32 cardinal & inter cardinal points, along with four 90 degree quadrants as an outer scale. Like many wood cased compasses of the period it is unsigned, but the use of concealed hinges attaching the lid to the base was a feature used predominately by Francis Barker, and it’s very likely this compass was made by Barker and dates to the mid 19th century. In working order with a lid activated transit lock, this compass is in very good condition as can be seen by the photos, and measures 80mm square & 25mm deep, a rare design for a wood cased pocket compass. A very distinctive brass cased Victorian brass pocket compass dating to around 1860. Although unsigned this compass is clearly a quality piece with a shapely blued steel needle engraved 'N' & 'S' in gold letters for clarity. The paper dial is in excellent condition with no tears or lifting, and is protected by a clean crystal. The brass case is free from any dents and has its original push on lid. In full working order, an elegant antique compass in good original condition. Dimensions are 36mm diameter and 10mm deep. This is a relatively rare prismatic marching compass engraved 'OFF.CHINAGLIA BELLUNO' on the underside of the lid which indicates it was made in Italy, possibly from parts originally made in Britain as the design is very much based on the Verners Pattern MK VIII models produced towards the end of WW1. Unlike the British examples which had a degrees dial, this has a mils dial which is rarely found in Verners pattern compasses and a tinted sight window in the lid. The clean central dial is aluminium and as can be seen from the photos the compass body is in good condition with minimal loss of its black finish on the lid, and a clean undamaged glass crystal. In good working order, it still has the rubber anti slip ring on the base underside. A rare compass from the post WW1 era, it comes with it's orginal Italian leather carrying case which is very good condition with all its stitching intact. Formed from the incorporation of Adam Hilger Ltd with E.R. Watts Ltd in 1948, this is a marked Hilger & Watts Ltd black lacquered brass trough compass likely made in the 1950s. Not used as a traditional compass and also known as a plane table compass, it was used to establish the direction of magnetic North when aligning a plane table or theodolite. The compass needle consists of a long narrow magnetised bar of steel, pointed at both ends, with the usual agate bearing at its centre. It also has a manual transit lock when the lid is slid in place, and is housed in a light mahogany case. Measuring 167 mm x 40 mm x 30 mm, and weighing just over 300 grams, it's in good working order as well as excellent cosmetic condition. This is a late 19th century nickel full hunter cased pocket compass signed 'CHADBURNS, LIVERPOOL'. Formed in 1818 by William Chadburn and David Wright, the business was taken over by Williams' three sons by the 1840s. The firm also exhibited at The Great Exhibition in 1851 and gained provenance by specialising in ships telegraphs at the end of the century. The cross bar needle pivots on a gemstone bearing for reduced friction, above a clean white enamelled dial with 8 cardinal and inter cardinal points split into four 90 degree quadrants, set under a clean domed bevelled edge crystal. A clean compass in working order it finds North easily and is in good cosmetic condition with no dents on the case. Dating to circa 1880, it measures 45mm in diameter not including the bow. The Francis Barker range of liquid filled prismatic compasses are among the finest professional compasses ever made, and are currently in use by many military forces around the world including NATO. This particular model is the M88 which is made from a lightweight yet robust aluminium alloy, and has 4 active self luminous tritium lights in the dial & capsule, but is missing the one that should be in the tip of the lid. Although used, the overall condition is still good retaining most of the olive green paint finish on the body, and it comes with a stitched leather case for protection in the field, also in very good condition. This M88 is a dual use model, with the dial calibrated in both mils & degrees, pivoting on a sapphire bearing, and has the serial no 060183 on the reverse. It measures 60mm in diameter and 30mm in depth, finds North easily and settles quickly, with no bubbles in the clear fluid. A late Victorian English made pocket compass in a nickel plated full hunter case, it measures 45mm in diameter not including the bow. The cross bar needle pivots on a red gemstone bearing for reduced friction, above a traditional dial with 16 cardinal & inter cardinal points, protected by a slightly bevelled glass crystal. Dating to the latter part of the 19th century, it doesn't have a makers name but has 'Made in England' on the dial. A very clean compass in working order it finds North easily, and in good cosmetic condition with no dents on the case. A rare Regency period mahogany cased Mariners compass measuring just over 52mm square. The attractive paper compass dial card is of a very early design and in surprisingly clean condition. Dating to between 1800 - 1820 and complimented by the small triangular hand made hinges, a clean compass which is probably approaching 200 years old. In good condition and in full working order, including the original transit lock, a nice example of a very early antique compass. The Union of South Africa was created in May 1910 as a new dominion of the British Empire, and this particular Dennison compass was issued to the South African military in 1917. It carries the Union of South Africa military mark which is denoted by the War Department arrow within the letter 'U' for Union and is engraved on the compass lid. It's also engraved Dennison Birmingham VI, 56278, 1917, and with the military arrow on the lid showing it was issued in to service. The full hunter nickel case is in very good condition, and the clean undamaged bevelled glass crystal covers an attractive jewelled bearing floating dial. In full working order, including a transit lock, it measures 45mm in diameter, not including the stem. An iconic WW1 compass with a rare South African provenance, it comes with a braided leather strap and T bar. This is a fine example of a Georgian compass circa 1820, set in a hinged mahogany block measuring 90mm square. Complimented by the small hand made hinges, it has a shapely blued steel needle engraved N & S for clarity, with a paper compass rose divided into degrees and also showing all the points of the compass with a fleur de lys for North. The needle is locked in position for transit by a brass pin which comes into play when the lid is closed. Fastened with two elegant scroll shaped brass clasps, the mahogany case is free of any splits or cracks, and although there is no makers mark, interestingly there are some hand written coordinates inside the lid. A genuine antique compass in working order, it retains the original hand cut glass, and the paper dial is in relatively clean condition for a compass which is nearly 200 years old. Housed in a dent free nickel plated full hunter case with its distinctive black & white Singers Patent style dial, it’s in good working order and the crystal is free from any chips. It measures 45mm diameter not including crown and ring, the floating card dial finds North each time, and pivots on a jewel for reduced friction. 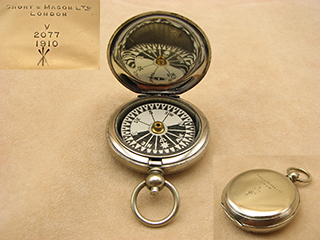 Unlike the majority of MK V compasses, the inner compass body is fixed to the nickel case by means of two small screws on the underside, which is a further design refinement, unique to only a very few makers including F Darton. The MK V was discontinued during 1917, so this is likely to be one of the last models made by one of the rarer makers of this style of compass. Founded by Thomas Cooke in 1837, the business was continued by his sons Thomas and Frederick under 'T. Cooke & Sons' following his death in 1868 and became a limited company in 1897. The business manufactured many scientific instruments for prestigious clients including the Royal Observatory at Greenwich, and set up offices in Capetown to cater to the demand for surveying instruments in response to the Witwatersrand Gold Rush of 1886. Made from bronzed brass, measuring just over 5 inches (130mm) in diameter and weighing just under 900 grams, this is an impressive surveying compass. In full working order, the needle pivots on a gemstone bearing above the silvered aluminium dial under a clean, chip free glass crystal. The two sight vanes at either side also activate a transit lock when folded and the face remains protected under a matching press fit lid when not in use. This 1930's gimbal mounted ships compass carries the famous Husun logo, the trademark of Henry Hughes and Son, the important & highly respected maker of quality nautical instruments. The liquid damped dial is signed 'HENRY HUGHES & SON Ltd, LONDON' with the serial number 8778, and the fleur de lis is embedded with the small HUSUN logo. In excellent condition all round, the damping fluid is clean with no air bubbles, and the glass cover is free from any chips, contained in a compass bowl retaining all of its black painted finish. Housed in a finger jointed mahogany case measuring 7½"(190mm) square and 5½"(140mm) in height, the dial diameter is 105mm. Weighing just under 3kg this is a serious ships compass that can still be used today. Marked 'ROYAL IRISH RIFLES. MAJOR JDM MCCALLUM D.S.O.' on the lid, this WW1 Verner's Pattern MK VIII compass belonged to Major John Dunwoodie Martin McCallum. McCallum was a recipient of the Distinguished Service Order during the battle of the Somme in 1916, along with the Croix de Guerre in 1918 and also received a CBE in 1921. Military career aside, McCallum was a versatile sportsman representing Ireland in both cricket and rugby, although badminton was his premier sport where he not only played for Ireland, but also served as president of the IBF in later years. In excellent cosmetic condition, it's engraved 'F-L No 92697, 1917' on the base and also has the War department military arrow. Still retaining virtually all of its black finish on the lid, the Mother of Pearl dial and glass covers are also in very good condition as is the original leather case. A genuine piece of Britain's WW1 history with some interesting provenance. 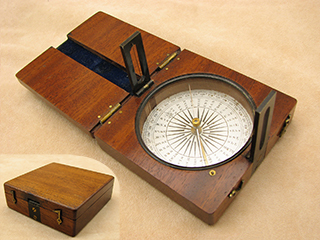 This unusual combined compass/clinometer is set in a very attractive mahogany case, with twin brass side fasteners. The elegant blue needle pivots over a paper dial which has 32 cardinal & inter cardinal points with an inches per yard outer scale. Like many wood cased compasses of the period it is unsigned, but the use of concealed hinges attaching the lid to the base was a feature used predominately by Francis Barker, and it’s very likely this compass was made by Barker. This compass is in superb condition as can be seen by the photos, and measures 73mm square & 19mm deep, a rare design for a wood cased pocket compass. This is a Handle compass clinometer, dating to the latter part of the 19th century. The English cross bar needle pivots on a gemstone bearing above an unsigned silvered dial with a 360 degree scale, and an inner four 90 degree quadrant scale for the clinometer function, which has a pendulous arm for measuring rise & fall. Readings of inclination are viewed through the handle sight which has a built in cross hair for accurate sighting of objects. In good condition with no dents on the brass casing and a chip free crystal, it measures 60mm in diameter not including the handle and is in full working order including the transit lock which is activated when the push fit lid is replaced. This brass marching compass dates to the end of the 19th century and is signed 'NEGRETTI & ZAMBRA, LONDON' on the lid. Very similar to the later Verners MK III patterns, it's a non prismatic model and the white compass card is surrounded by a silvered bearing ring, with a brass manual transit lock and finger brake on one side. In good working order, it measures 50mm in diameter and is in good used condition, with a heavy bevelled crystal that emphasises the quality of this piece and comes in a leather case. This is a Bausch & Lomb WW1 Verner's pattern MK VIII prismatic marching compass dated 1917 with leather case. Engraved on the underside is 'B-L no 69980 1917' and stamped with the British Army War department arrow. In very good condition all round, with a Mother of Pearl dial for low light reading, it has a gemstone bearing for reduced friction and there is a transit lock activated by lid closure. The brass case is dent free and still has its anti slip rubber ring on the underside, and the leather case is also in good condition. In good working order, a genuine piece of Britain's WW1 history. A good example of a full hunter cased pocket watch style compass, with a gemstone pivot floating dial, and set in a nickel plated case. Although not signed by any maker, it was probably made by Francis Barker in the pre WW2 period, and is the MK VII version which was the last model of the hunter cased pocket watch style designs that were developed during WW1 for British Army Officers. In very good condition, the case is good with a clean undamaged crystal, all in fine working order, including an automatic transit lock when lid closed and comes with its original chamois pouch. Measures 45mm in diameter. Please study the photos as they are part of the description, and I will be happy to answer any questions if I can. Dating to the first half of the 19th century (circa 1840), this is a very rare brass gimballed pocket compass. Housed in a brass case with a separate brass lid, it measures 70mm in overall diameter, and stands 45mm high. In good original condition, the distinctive compass card pivots on a a gemstone pivot bearing, and sits in a 50mm diameter brass bowl which remarkably still has all its original lacquer coat. In full working order including the gimbal mechanism and transit lock, this is a quite unique antique compass. A nice example of one of the rarer British Army Officers MK V pocket compasses signed 'Ed KOEHN, GENEVA, SWITZERLAND, V, 34757, 1915' with the military arrow engraved on the lid. The full hunter case is in very good condition, retaining all of its nickel plating and comes with the distinctive Singers patent style black & white dial card, which pivots on a gemstone bearing for reduced friction. Housed under a clean bevelled glass crystal, it's in full working order with a strong hinge and a functional transit lock. It measures 45mm in diameter, not including the stem. This is a particularly rare pocket compass made by Short & Mason in the late 19th century, housed in a leather covered wooden case and intended for use at sea, probably as a personal instrument. The compass bowl is gimbal mounted in the nickel plated body which can be removed from its wooden case, and activated by pulling out the inner bezel to release the transit lock. Pushing the compass bowl back relocks the dial to avoid wear in transit. It has a Singers Patent style mother of pearl dial which pivots on a gemstone bearing for reduced friction and as can be seen from the photos is in very good clean condition. The compass measures 55mm in diameter and 17mm deep which extends to 25mm when the bowl is raised. In good working order the only minor blemish is that the outer wooden case is a little warped on the lid so does not quite meet flush when closed. A rare design of compass by a well respected maker, its' signed Short & Mason Ltd, London on the underside. Dated 1940, this is a fine example of a WW2 MK III prismatic compass, made by Francis Barker on a wholesale basis, and rebranded by T. G. Co Ltd. It has a liquid damped bowl (no bubbles) with a mother of pearl dial calibrated in 360 degrees, and is in fine working order, finding North easily and settling very quickly. The compass body is of blackened brass, with only some very minor paint loss here and there, and the original rubber anti slip ring on the base is still intact. Engraved on the base is 'T.G. Co. Ltd. London, No.B 56440, 1940, MK III', it also has the War department broad arrow. It comes with a sturdy leather carry case which is in good original condition. A classic WW2 instrument that is not only a collectors piece but is still very much a functional compass, which compares well to the modern equivalents. This is a WW1 era Short & Mason MK VII prismatic marching compass with leather case dated 1917. Engraved on the underside is 'SHORT & MASON, LONDON, Ltd' and stamped MK VII on the lid. In very good condition all round, with a Mother of Pearl dial for low light reading, it has a gemstone bearing for reduced friction and there is a transit lock activated by lid closure. Dating to circa 1880, this is a quality item made by Dollond, and is signed 'DOLLOND, LONDON' on the dial. The clean dial pivots on a gemstone bearing and is set under a damage free crystal, encased within its nickel plated case which is in dent free condition, and retains its nickel plating. In good working order with a strong hinge, this is quite a rare compass from one of the most renowned instrument makers of the 19th century, and measures 45mm diameter not including the bow. This is a fine example of a mid 19th century mariners compass mounted on gimbals in a mahogany case with a sliding bevelled lid having the words 'Mariners Compass' written in ink. The mahogany case has early dovetail joints and is in sound condition, measuring 4.5" (115mm) square and just under 3" (72mm) in height. The compass floating card dial has 32 cardinal and inter cardinal points with a distinctive Fleur de lis crest denoting North and pivots on a gemstone bearing set within a lacquered brass compass bowl of just 67mm, making this a smaller example than usual and therfore not so common. Dating to circa 1850, this is a robust little compass weighing just over 400 grams and is in good working order with a clean dial and glass crystal. This is a very early WW1 'Angle of Sight' instrument with a low serial number, and made by J H Steward in 1916. Most examples I have seen in the past were from the WW2 period, so quite unusual to find one this early in such good condition. Constructed from bronzed brass, its engraved 'Angle of Sight Instrument, H.A. MK I, J H Steward Ltd, 1916, No 407'. It comes with the original leather case which also carries the War Department arrow showing that it was military issue. A precision instrument which incorporates a prismatic compass, consisting of a green card dial with Fleur de Lis North pointer, and a clinometer visible in the vertical plane. In very good condition retaining virtually all its original black finish, and in full working order this type of instrument was often used by artillery regiments in the British army for range calculations and targeting heavy guns. In good working order, weighing 430 grams in its case and measuring 70mm in diameter across the main body. A stylish example of an Edwardian hunter cased pocket compass with an English cross bar needle on a jewelled pivot, over a decorative frosted aluminium dial. Dating to around 1910, its in very good clean condition with a clear undamaged crystal on which the main cardinal points are painted in red on the underside. The brass case is also in good condition with a warm patination, and is dent free. Measuring 38mm in diameter not including the bow, this is a sturdy little compass in full working order including the transit lock which is activated by lid closure. This brass cased pocket compass is signed 'ELLIOTT & SONS, 56 STRAND' on the dial around the pivot. The founder William Elliott formed a partnership with his sons Frederick & Charles in 1850, and the firm became known as Elliott & Sons. However, the name was changed to Elliott Bros from 1854 after William retired in 1853, so we can date this compass quite accurately to between 1850 and 1854. The stylish blued steel directional needle is engraved N & S in gold lettering & pivots on a brass capped bearing above a traditional dial, denoting 32 cardinal and inter cardinal points under a clean undamaged crystal. In working order and measuring 60mm in diameter, the brass case is free of any dents or deformities as is the matching original lid and comes with a modern velvet drawstring pouch for added protection. A fine example of a full hunter cased pocket watch style compass, with a gemstone pivot floating dial, and set in a nickel Dennison case which is stamped Dennison Watch Case Co inside the base cover and numbered 6617 inside the lid. Although not signed by any maker, it was probably made by Francis Barker in the pre WW2 period, and is the MK VII version which was the last model of the hunter cased pocket watch style designs that were developed during WW1 for British Army Officers. In good condition, the case retains all its nickel plating and has a clean undamaged crystal. All in good working order, including an automatic transit lock when lid closed, it measures 45mm in diameter. Considered to be the best hand held military compass in the world, this Francis Barker M-73 prismatic compass is in virtually mint condition with no paint loss, as can be seen from the photos. Currently in use by many military forces around the world including NATO, it's made from brass/aluminium, and has self luminous tritium lights enabling full night and day operation. This particular example numbered '66014' is the liquid filled mils version with a precision sapphire bearing. It comes with a quality stitched leather case and shoulder strap for protection in the field. You really can't get a more accurate compass, and this is perfect for anyone involved in outdoor pursuits who needs a precision compass. In good working order with no bubbles in the liquid and active tritium lights, used models are rarely available in such fine condition. 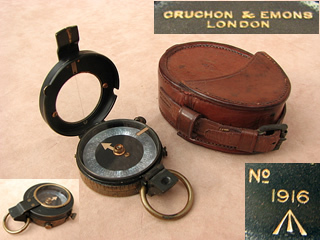 A superb WW1 military pocket compass, engraved F Darton & Co London, VI, No 1793, 1917. Unusually, the engraving is on the base of the compass, and also has the military arrow denoting it was War department issue. The inside of the lid is also stamped 179827 M.
The fully nickel plated case is in very good condition with no dents, and the bevelled glass crystal covers a clean aluminium dial pivoting on a gemstone bearing. In full working order, with a strong hinge and a functional transit lock, a fine compass from one of the rarer makers, it comes in a pigskin leather pouch which may be a later addition. The Francis Barker range of fluid damped prismatic compasses are among the finest professional compasses ever made, and are currently in use by many military forces around the world including NATO. This particular model is the M88, made from a lightweight yet robust aluminium alloy, and has 5 active self luminous tritium lights enabling full night and day operation. A dual use model, it's calibrated in both mils & degrees, includes a matching lanyard and also carries the Nato stock no 6605-99-225-8550 on the reverse along with its serial no 13641. Still in its original cardboard box, it clearly has had very little use and the overall condition is excellent. You really can't get a more accurate compass, and this is perfect for anyone involved in outdoor pursuits. Measuring 60mm in diameter and 30mm in depth, it's in full working order with no bubbles in the fluid. 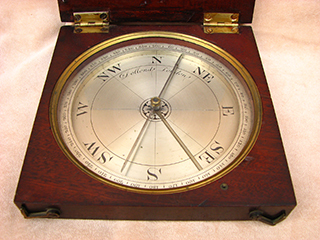 An early Victorian pocket compass set in a mahogany case, with an attractive paper sunburst dial, divided into 90 degree quadrants and displaying 32 cardinal and inter-cardinal points. Dating to around 1860, it has its original glass crystal which is retained by a brass bezel, and a flat blued steel needle, with the letters ‘N’ & ‘S. As with many wood cased compasses of the period this is unsigned, but the use of concealed hinges attaching the lid to the base, was a feature used predominately by Francis Barker, and it’s very likely this compass was made by Barker. This is a nice clean compass, with both crystal and dial in good condition and a transit lock activated on lid closure. Fastened with an elegant 7 shaped brass clasp, it measures 65mm x 63mm x 16mm. A real classic piece with a traditional design. This Angle of Sight instrument is dual purpose in that it incorporates a prismatic compass, consisting of a green card dial with a 360 degree scale, and an Inches per Yard clinometer, visible in the vertical plane. These two functions are controlled by the brass button on the side which locks the compass when using the clinometer, and vice versa. Although unsigned, the clinometer card shows 'Patent No. 1926' which was applied for by Francis Barker and subsequently appears in their 1919 catalogue, where it's referred to as a ‘combined altitude instrument and prismatic compass’ indicating that it was manufactured by Francis Barker on a wholesale basis. Retaining all of its original black finish and in full working order, this type of instrument was often used by civil engineers and also artillery regiments in the British army for range and trajectory calculations to target heavy guns. In very good condition including its leather case, this is a precision instrument in good working order, weighing 450 grams in its case and measuring 70mm in diameter across the main body. This brass cased pocket compass is signed 'AITCHISON LONDON' on the lid, dating to the latter part of the 19th or early 20th century, long before the merging of Dollond and Aitchison in 1927. It has a distinctive floating aluminium dial, which pivots on a gemstone bearing under a clean crystal with the four main cardinal points painted in red on the underside. The case is free from any dents and retains all its black coating inside and has a pleasing age patination on the outside. In full working order with a transit lock activated by lid closure to minimise wear on the pivot, this is a rare example of a more unusual pocket compass by a prestigious instrument maker, measures 50mm diameter and 15mm deep and comes in a later velvet drawstring pouch for protection. A small early 20th century gimbal mounted mariners compass inscribed 'Star Boston. U.S.A. 47813'. 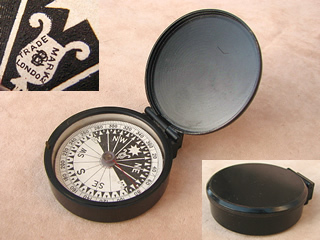 The Star Compass Company was founded in 1905 in Dorchester, Boston U.S.A. and specialised in liquid marine compasses. The liquid damped dial is very clean and has 32 cardinal and inter cardinal points with the Star Compass Company logo denoting north. 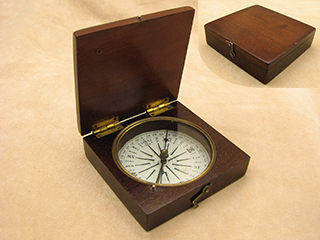 The compass is mounted in a box jointed mahogany case with a separate sliding lid, the dimensions are 4.5" square (114mm) by 3.5" deep (90mm), and the overall compass bowl diameter is just over 72mm with a dial diameter of 52mm. Weighing just under 700 grams this is a robust little compass in good working order that is not only a collectors piece but also practical for todays use. This is a relatively rare prismatic marching compass engraved 'PRISMATIC COMPASS MARK V' on the lid and was produced as an alternative to the more popular Verner's pattern models which were the mainstay of the British Army during WW1. Whilst there are no real shortages of the WW1 Verner’s pattern compasses, numbers of the Barker's models are very much less, and the underside is engraved 'BARKER & SON, LONDON, No 1129, 1905' and also has the military arrow. The clean central dial is mother of pearl for low light reading, and as can be seen from the photos the compass body is in good condition with minimal loss of its black finish on the lid, and a clean undamaged glass crystal. In good working order, it still has the rubber anti slip ring on the base underside. A rare compass from the pre WW1 era, it comes with the leather carrying case which is very good condition with all its stitching intact. Tunbridge Ware items originated from the spa town of Royal Tunbridge Wells and were at the height of their popularity in the 18th and 19th centuries. This is an elegant victorian pocket compass housed within a Tunbridge Ware casing complete with domed lid and decorated with a geometric mosaic star design made up of natural coloured woods, the triangles surrounding the octagram being made from green oak. The lid unscrews to reveal a stylish directional needle engraved N & S in gold lettering & pivots on a brass capped bearing above a traditional dial, denoting 16 cardinal and inter cardinal points under an undamaged crystal with a Fleur de Lis North pointer. Measuring 50mm in diameter by 17mm high and in good working order this is a particularly rare combination of compass and Tunbridge Ware design, all in very good condition. This late 19th century brass cased compass with a separate push fit lid was made by Francis Barker & Son as evidenced by the small FBS logo within the Trademark London triangle, and printed on the card dial just below the North cardinal point. The directional needle pivots on a brass capped bearing above a traditional dial, denoting 16 cardinal and inter cardinal points under a clean undamaged crystal. In working order and measuring 40mm in diameter, the brass case is in excellent condition retaining all of its lacquer and is free of any dents or deformities. A British Army WW1 Verner's Pattern MKVII prismatic marching compass with leather case, all in very good condition. Marked S F Thomas on the case, this compass belonged to one Lieutenant Colonel Stanley Ford Thomas of the 6th Battalion Shropshire Light Infantry. Thomas was also a recipient of the Distinguished Service Order during the first World War and later promoted to Major on October 3rd 1922. The leather case is embossed 'MARTINS-BIRMm LIMd 1916' with military arrow and has fully intact stitching and shoulder strap. The compass is engraved 'ANGLO-SWISS ASSOCIATION No. 45553, 1915' on the base and stamped with the War department military arrow. Still retaining virtually all of its black finish on the lid, the Mother of Pearl dial and glass crystal are in very good condition, and the base still has its original rubber anti-slip ring. In full working order including the manual transit lock, and weighing in at just under 300 grams this is a genuine piece of Britain's WW1 history with some interesting provenance. This British Army Officers hunter cased pocket compass is signed 'Stanley, London, V, 106544, 1916' with the military arrow engraved on the lid, and with so many reproduction instruments bearing the name Stanley London on the internet, its a rare treat to find one of the few genuine items with the MK V design. The full hunter case is in excellent condition, retaining all of its nickel plating, and comes with the distinctive Singers patent style dial card, which pivots on a gemstone bearing for reduced friction and is housed under a clean beveled glass crystal. In full working order, a very clean compass with a strong hinge and a functional transit lock, it measures 45mm in diameter, not including the stem. This brass cased green card dial prismatic compass with folding sight vane was made toward the latter part of the 19th century, and is in good cosmetic condition with a clean crystal under which the dial pivots on a gemstone bearing. Although unsigned this a quality antique instrument measuring 70mm diameter & comes with its original leather case which has had a small repair on the locking strap but is also in good condition with sound stitching. In good working order, the compass and case together weigh just under 300 grams. This is a WW1 Verner's pattern MK VIII prismatic marching compass dated 1918 with leather case. Engraved on the underside is 'E.R. Watts & Son, London 1918, 118297' and stamped with the British Army War department arrow. A very impressive explorers brass cased compass made in France during the early part of the 19th century. Signed 'Buron Paris' the business was first established in 1788 by Buron and later carried on by his optician son from 1818 onwards who worked closely with Lerebours on landscape lenses for Daguerreotype cameras, and became a Knight of the Royal Order of the Legion d'Honneur in 1844. The attractive floating dial is in very good legible condition, pivoting on a jewelled bearing and housed under a clean glass crystal. The lacquered brass case is also in very good condition, still having most of its original lacquer, albeit with some minor surface tarnishing but no dents, and has its original push on protective brass lid. In full working order, an early antique compass which measures 100mm diameter and 43mm deep with a weight of just under 350 grams. This explorers style compass dates to the mid 19th century and was made by James Parkes & Son of 5 St. Mary's Row, Birmingham, indicated by their custom trademark logo of an eye with brow which could suggest a masonic connection. In very good condition all round, the distinctive black & white dial has 32 cardinal and intercardinal points with a fleur de lis denoting North, housed under a clean glass crystal. Housed in dent free brass case with original lid, it's in good working order and measures 55mm diameter and 22mm deep. This is an elegant early Victorian brass cased pocket compass dating to around 1840. Although unsigned this compass is clearly a quality piece with a floating card dial which is surprisingly clean for an item well over 160 years old. The distinctive black and white dial has 32 cardinal and inter cardinal points with a fluer de lis indicating north, under a clean crystal. Housed in dent free brass case with original domed lid, it's in full working order and measures 45mm diameter and 15mm deep. This black lacquered brass trough compass although unsigned was probably made for the British Military during WW1 and used by surveyors and artillery crew to accurately establish magnetic north. The compass needle consists of a long narrow magnetised bar of steel, pointed at both ends, with the usual agate bearing at its centre and unusually this example has a pair of folding sight vanes. It also has a manual transit lock and is housed in a leather covered case with an interior catch that clicks shut. Measuring 170mm x 33mm x 20mm, it weighs 450 grams in its case and is in good working order as well as excellent cosmetic condition. A large 19th century gimbal mounted mariners compass of impressive proportions. The floating dial pivots on a gemstone bearing, has 32 cardinal and inter cardinal points with the outer edge marked in four 90 degree quadrants, and there is a distinctive Fleur de Lis crest denoting North. In excellent condition all round, the card dial is clean with a glass cover free from any chips or cracks, and a dent free painted brass bowl. The compass is mounted in a dove tail jointed mahogany box with a separate bevelled lid, dimensions are 7.5" square by 4.5"" deep, and the compass bowl diameter is just over 4". A visually stunning antique compass in good working order, which would look great in most surroundings. In good working order, this is a substantial instrument weighing nearly 1.6kgs. This is an unusual arrangement of a brass bowl gimbal compass with a Singers Patent black & white dial, mounted in a purpose made rectangular mahogany case with dove tail joints. The distinctive floating card dial pivots on a gemstone bearing and has the words ‘SINGER’S PATENT’ printed under the south point. The gimbal ring is mounted on a removable flat panel and the case has a sliding lid which has a small piece missing on one corner. It dates to the third quarter of the 19th century and the compass is in good working order easily finding North. A quirky but decorative item, the compass bowl is just 70mm in diameter, and the case measures 165mm long by 110mm wide and 55mm deep. This is a WW1 Verner's pattern MK VIII prismatic marching compass dated 1917 on the leather case. It was made by F. Darton & Co, but the engraving is very faint so the serial number can't really be read, although it is stamped with the British Army War department arrow. In very good condition all round, with a jewelled bearing Mother of Pearl dial, the brass case retains virtually all its non reflective black finish, and there is a transit lock activated by lid closure. It still has its anti slip rubber ring on the underside, which is so often missing on these compasses, and comes with a leather case which is also in good condition. An impressive Georgian mahogany cased pocket compass measuring 80mm square with an attractive paper dial of a particularly early design, it dates to the first quarter of the 19th century circa 1820. Complimented by the small hand made hinges & fastened with an elegant 7 shaped brass clasp, the paper compass rose is divided into degrees showing all the points of the compass with a fleur de lys for North, & despite some minor age foxing is in relatively clean condition for a compass which is close to 200 years old. Although the shapely steel needle has some oxidisation which is not surprising for a compass of this age, the engraved N & S is still just visible and sits under the original glass crystal which is free of any damage. A genuine antique compass with a traditional design, it's in full working order including a transit lock activated by lid closure. This elegant brass cased explorer’s style compass with a separate push fit lid dates to the second half of the 19th century and is signed 'H.Hughes 59 Fenchurch St, London' in the centre of the dial. Made by Henry Hughes & Son around 1880, the stylish blued steel directional needle is engraved N & S in gold lettering & pivots on a brass capped bearing above a traditional dial, denoting 32 cardinal and inter cardinal points under a clean undamaged crystal. Although the lacquered brass case does have some minor lacquer loss on the lid, it is free of any dents or deformities. This is an antique compass of high quality in very good condition and in full working order. The dimensions are 70mm diameter and 17mm deep. This is a WW2 full hunter cased British Army Officers pocket compass, engraved 'MK VI 1940, F Barker &Son (1932) Ltd, London, B 5961' on the lid and also has the War department military arrow, which shows it was issued to the field. Made by Francis Barker, the nickel plated hunter case is in very good condition, with a bevelled glass crystal covering the jewelled floating dial. Measuring 45mm in diameter, its in good condition, and in full working order, with a transit lock activated by lid closure. This is a WW1 Verner's pattern MK VII prismatic marching compass dated 1916 with leather case and carry strap. Engraved Cruchon & Emons, London, it's also stamped with the British Army War department arrow on the underside of the compass body. The brass case is dent free and still has its anti slip rubber ring on the underside, which is so often missing on these compasses. It comes with a leather case which is also in very good condition with all stitching intact and inscribed J.M Haigh and L/Cpl. Heyes, who presumably were previous owners. This brass cased, green card dial prismatic compass will be of particular interest to both Francis Barker & Negretti & Zambra collectors alike. Although carrying the name of 'Hirsbrunner & Co Shanghai' on the dial, who were sole agents for importing Negretti & Zambra instruments, the compass was actually made by Francis Barker & Son whose trade mark logo is on both the dial & lid. Made toward the end of the 19th century circa 1890, the compass is in excellent cosmetic condition with a clean crystal under which the dial pivots on a gemstone bearing. In good working order, this a quality antique instrument measuring 88mm diameter & comes with its original leather case which is also in very good condition with sound stitching. Compass and case together weigh just under 500 grams. Whilst there are no real shortages of the WW1 Verner’s Pattern prismatic compasses, this particular example is a rare experimental version of the MK VII model with a black embossed dial. The compass has no serial number, only the letters M10 along with the date 1918 on the reverse, and interestingly the word REJECTED. However the compass is in perfect working order so I believe it was rejected on the basis of design rather than function which further endorses the view that it was a prototype. In addition the lid has what appears to be some type of correction table engraved on it, along with the MK VII identification. As can be seen from the photos it is in very good condition with minimal loss of its black finish, and a clean undamaged glass crystal. This is a nice example of an early 20th century pocket compass marked 'REG.NO. 416645' on the dial, the design patented by Francis Barker & Son. The dial design is sometimes referred to as the R.G.S. (Royal Geographical Society) pattern which was in use in the late 19th century, before the patent was applied for by Francis Barker in 1903. The aluminium dial is clean, unblemished & pivots on a gemstone bearing under a chip free glass crystal. The hunter case is in good condition with no dings or dents, and still retains virtually all its non reflective finish. 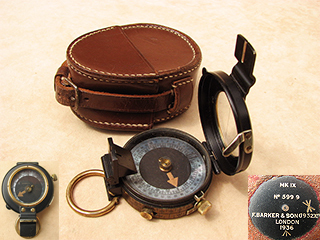 Measuring 45mm in diameter and 15mm deep, the compass is in good working order including the lid activated transit lock, and comes in a brown leather case which is also in very good condition. This is quite a rare example of a leather cased MK IX prismatic marching compass, engraved on the reverse: 'CKC/C, 5852C MK.IX, 1943'. Although Francis Barker had the patent rights for many military compasses including this model, and used a large proportion of their production for supply to other instrument makers, the absence of the 'B' prefix on the serial number shows it was actually made under licence by the Canadian Kodak Company for the Canadian military during WW2. In full working order, the aluminium dial pivots on a gemstone bearing under a clean chip free crystal. In very good cosmetic condition, it also has an automatic transit lock activated by lid closure, and comes with a 1928 dated leather case which is also in very good condition. This is a very elegant mid 19th century pocket compass circa 1860, set in a hinged mahogany block with chamferred sides on the lid which is fastened by two side brass clasps. It has a shapely blued-steel needle engraved N & S for clarity over a traditional paper dial incorporating eight cardinal points, with an elaborate fleur de lis denoting North. This is one of the larger examples measuring 115mm square and is in very good condition with a clean crystal and dial. Although unsigned, as many 19th century wood block compasses are, the concealed hinges were a feature almost exclusively used by Francis Barker & Son, and the quality is certainly in keeping with that makers reputation. In full working order, including the transit lock this is an impressive Victorian compass, with a particularly attractive compass rose. A distinctive early Victorian brass cased pocket compass dating to around 1850. Although unsigned this compass is clearly a quality piece with an English cross bar needle pivoting on a gemstone bearing over a clean paper dial with no tears or lifting and is protected by a clean crystal (please note there is a tiny edge chip on the glass around the transit lock stem, but very hard to see). The lacquered brass case is free from any dents and has its original push on lid which activates the transit lock when closed. In full working order, it measures 38mm diameter and 14mm deep. A very elegant brass cased explorer’s style compass with a separate push fit lid made by Francis Barker & Son around 1880, as evidenced by the small FBS logo within the Trademark London triangle, and printed on the card dial just below the North cardinal point. Although the lacquered brass case does have lacquer loss in some areas as can be seen in the photos, it is free of any dents or deformities. This is an antique compass of high quality, by the most renowned of all compass makers, and in full working order, including a lid activated transit lock. The dimensions are 70mm diameter and 16mm deep. This brass trough compass was made by Francis Barker & Son for use by the British Military during the WW2 era, and is engraved 'F.B&S 1932 LTD, M.K. II,' with a military crowfoot arrow on the side. Not used as a traditional compass and known also as a plane table compass, it was used by surveyors to establish the direction of magnetic North when aligning a plane table or theodolite. The needle of the compass consists of a long narrow magnetised bar of steel, pointed at both ends, with the usual gemstone bearing at its centre for reduced friction. In good condition and housed in a bakelite case with a sliding lid that activates a transit lock for when the instrument is not in use. Measuring 165mm x 35mm x 25mm, it weighs just over 200 grams and is in good working order. This is a quite unique example of a late 19th century mariners compass mounted on gimbals in a mahogany case with decorative brass corner brackets, all in very good condition. Usually these styles of compasses are quite large, but this particular example, is only 3" (75mm) square & 1.5" (40mm) in height, with the compass bowl being just 45mm in diameter, making it a very compact and consequently much rarer instrument. The compass floating card dial is the distinctive Singers Patent black & white design pivoting on a gemstone bearing, and is set within a lacqured brass bowl which is free of any knocks or dents, and retains nearly all its original finish. An unusually small, yet robust little compass weighing only 170 grams, it's in full working order with a clean dial and glass crystal. This impressive English surveyors compass was made sometime in the first half of the 19th century by Edward Bryan in Manchester. Fitted in a velvet lined mahogany case with folding sight vanes, it's signed on the dial 'EDWARD BRYAN, 24 CROSS STREET MANCHESTER'. The English cross bar needle pivots on a gemstone bearing above the silvered dial under a clean, chip free glass crystal, and also has a lid axctivated transit lock. This is a substantial compass example measuring 180mm x 155mm x 40mm, with a dial diameter of 120mm, and weighs just under 1kg. The cosmetic condition is really very good as can be seen from the photos, the mahogany case in particular having a warm patination that only comes with the passage of time. Not only is this an antique precision compass in full working order, but now 150 years later it would grace any executive desk as a unique decorative item. This is an unsigned brass marching compass dating to the end of the 19th century period with a dial design used by Ross. Very similar to the Verners MK III patterns it's a non prismatic model, & the white compass card is is surrounded by a silvered bearing ring, with a brass manual stop & finger brake on one side. In good working order, it measures 2" in diameter & is in good used condition, with a heavy bevelled crystal that emphasises the quality of this piece. Comes with a leather case from the same period. Dating to the first half of the 20th century, this large Oak cased compass measuring 8.5" square was originally made for educational purposes but today makes an impressive desk ornament. Made by Francis Barker & Son in the 1930's for the London County Council education department, it also has the Trade Mark London logo arranged in a triangle above the North fleur de lis, within which are the superimposed F B & S letters. The attractive paper dial is in exceptional condition with no staining as is often found in other compasses of the period, and is set under a jewelled steel needle measuring 6.5" in length, the glass crystal is also original and in excellent condition. Not only a decorative item, but also a functional compass in working order including the transit lock, this is a substantial instrument weighing just over 1kg. This is a good example of a leather cased MK IX prismatic marching compass, with a relatively early serial number and is engraved on the reverse: 'MK. IX, No 599 9 F.BARKER & SON. (1932) Ltd, LONDON, 1936' (also has the British Army War office military arrow). In full working order, it also has the traditional Mother of Pearl dial for low light reading, and is in very good condition, retaining virtually all of its original black finish. A dry dial compass with a gemstone pivot bearing, it has an automatic transit lock activated by lid closure, and protected by its original tan leather case which is also in very good condition. 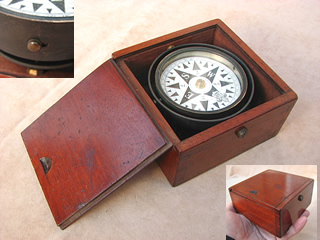 This is a fine example of a mid 19th century mariners compass mounted on gimbals in a mahogany case with a sliding lid. The mahogany case has early dovetail joints and is generally in sound condition, measuring 4.5" (112mm) square & just over 2" (55mm) in height. With a compass bowl diameter of just 75mm this is a smaller example than usual and therefore not so common. The compass floating card dial pivots on a gemstone bearing, and is set within a bronzed brass bowl which is free of any knocks or dents and retains all its original finish, unusually it also has a transit lock operated by a sliding brass button on the side of the brass bowl. Dating to circa 1850, this is a robust little compass weighing just under 500 grams and is in full working order with a clean dial and glass crystal. A good example of a full hunter cased pocket watch style compass, with a gemstone pivot floating dial, and set in a nickel plated case which has the insignia badge of the Royal Air Force Germany (Keepers of The Peace) attached to the lid. The compass dates to the pre WW2 period, but RAF Germany was formed in 1959 so the insignia was added after this time. Although not signed by any maker, it was probably made by Francis Barker and is the MK VII version which was the last model of the hunter cased pocket watch style designs that were developed during WW1 for British Army Officers. In very good condition, the case is good with a clean undamaged crystal, all in fine working order, including an automatic transit lock when lid closed. Measures 45mm in diameter. This early 20th century gimbal mounted ships compass carries the famous 'Sestrel' logo, the trademark of Henry Browne & Son, the important & highly respected maker of quality nautical instruments, used on naval & merchant ships since the mid 19th century. The dry card floating dial pivots on a gemstone bearing, has 32 cardinal & inter cardinal points with the outer edge having a 360 degree scale, and North is denoted by the distinctive triangular Sestrel logo. In excellent condition all round, the card dial is clean and the glass cover is free from any chips or cracks. The compass is mounted in a golden oak box with separate sliding lid, dimensions are 7" square by 4.5" deep, and the compass bowl diameter is 4.25". An impressive compass in good working order and would look great in most surroundings, it weighs just over 1.7kgs. A fine example of a Francis Barker & Son 19th century hunter cased pocket compass, having a black & white Singers patent style card dial with the FBS trademark logo printed just below the North Star point. The intertwined FBS letters of the logo show the 'S' to be reversed in recognition of the death of Francis Barker in 1875, so made after that date & likely to be circa 1890. Of brass construction, with a clean glass crystal having a red lubber line painted on the underside, it's in very good condition all round, and the case is free from any dents retaining virtually all its black coating. In full working order with a transit lock activated by lid closure, this is one of the more unusual pocket compasses by a much sought after maker, measures 60mm diameter and 20mm deep. This is a WW1 Verners pattern MKVII prismatic marching compass with leather case. In excellent cosmetic condition, it's engraved 'Cruchon & Emons London No 1916' on the base and also has the War department military arrow. The leather case is also embossed with the military arrow so is likely to be the original case, which is also in good condition & all stitching intact. Still retaining virtually all of its black finish on the lid, the Mother of Pearl dial and glass covers are in very good condition. The serial number is 17678 which is engraved inside the lid. In full working order, a nice complete example. An attractive early Victorian pocket compass set in a fishskin covered case, measuring 52mm in diameter, and dating to circa 1860. The elegant blued steel needle is impressed 'N' & 'S' in gold letters for clarity, and sits over a traditional paper compass dial which is still very legible, incorporating 16 cardinal & intercardinal points with a fleur de lys for North. The compass glass crystal is protected by a silk lining on the lid, which is fastened by an ornate brass clasp. In working order, the cosmetic condition of both compass & outer case is good, the case in particular having a sound hinge and clasp. This is a WW2 Artillery compass made by Francis Barker during the 1930's and is engraved 'F.B. & Son. (1932) Ltd, B 2037' on the lid, it also has the military arrow which indicates it was issued into service. In full working order, this is a prismatic compass with a 360 degrees silvered dial which finds North consistently, and is protected by a separate push fit lid. It comes with its own fitted leather case which is also in good condition, all stitching is sound and it still has the original shoulder strap. Weighing just over 0.5kgs with its leather case, the base also has a threaded boss for attaching to a tripod. Not only a collectors piece, but a practical compass for use today. This Edwardian pocket compass with the unusual feature of a folding gnomon is set in a mahogany case, with an elegant scroll shaped brass fastener. The clean paper dial has a 360 degree graduated scale for compass readings, with 8 main cardinal points. In very good cosmetic condition as can be seen by the photos, it measures 63mm square & 18mm deep. A nice clean compass dating to the early 1900's, it's a visually impressive piece and fully functional with a lid activated transit lock. A large impressive mid 19th century ship or boat compass with brass bowl and gimbals, housed in its original Oak box with sliding lid. The floating card dial pivots on a gemstone bearing, has 32 cardinal & inter cardinal points with the outer edge marked in degrees, and there is a distinctive Fleur de Lis crest with crossed arrows denoting North. An unsigned piece which is complete and in good sound condition, although there are some old ink stains on the front. Box dimensions are 8" square by 6" deep, compass diameter is just over 5" this is a substantial instrument weighing over 2kgs and in good working order. An attractive 19th century brass cased pocket compass that unusually has what appears to be a silver North cardinal point on the dial. Signed 'CALLAGHAN LONDON'around the centre point on the floating card dial which pivots on a gemstone bearing under a clean glass crystal, it dates to the second half of the 19th cenury and was probably made by William Callaghan who worked at various addresses in London from 1860. A small compass measuring just under 37mm in overall diameter, it's in good working order and also has a a built in transit lock which is activated when the brass lid is in place. This is a rare example of a Mark V prismatic marching compass which was superceded by the more common MK VII shortly after the start of WW1. The MK V is much less common and difficult to find, let alone in such good condition, still having its anti slip friction ring and a very clean mother of pearl dial. It's dated 1906 and signed 'SHORT & MASON Ltd, No 1950, 1906' on the underside & 'PRISMATIC COMPASS MARK V' on the lid along with the military arrow. As can be seen from the photos it is in good cosmetic condition and in full working order. The accompanying stitched leather case is also in good sound condition. A superb example of a WW1 British Army Officers MK V pocket watch compass by L Kamm, in a full hunter nickel case which is in excellent dent free condition. The lid is engraved 'L Kamm & Co, London, V, 49194, 1915', along with the military arrow showing it to have been issued into service. This compass is in very good cosmetic condition as can be seen from the photos, with a thick bevelled glass crystal covering the distinctive Singers patent style black & white floating dial, which is mounted on a jewelled brass bearing for reduced friction on the pivot point. Unlike the majority of MK V compasses, the inner compass body is fixed to the nickel case by means of two small screws on the underside, which is a further design refinement, unique to only a very few makers including Kamm. A fine working example from one of the rarer makers who did not use the more common Dennison case. In full working order, with a strong hinge including the transit lock, it measures 45mm in diameter. 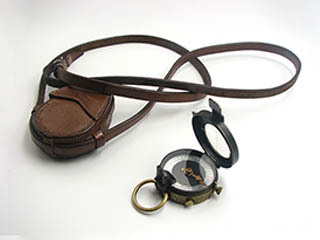 An unusual Hunter cased combined pocket compass & clinometer with integral folding sight vanes. No makers marks and of nickel plated brass construction, it's generally in very good condition & probably dates to the early part of the 20th century. The compass has a needle with a red gemstone pivot, set over an aluminium 2 tier dial, the upper 360 degree scale being for compass readings, and the lower 180 degree scale is for the clinometer function. All in good working order with a manual transit lock, it's a substantial instrument measuring 60mm diameter and 25mm in depth. A stylish example of an Edwardian hunter cased pocket compass with an English cross bar needle on a jewelled pivot, and signed 'F.BARKER & SON MAKERS LONDON' on the frosted aluminium dial. Measuring 50mm in diameter not including the bow, this is a sturdy yet attractive compass in full working order including the transit lock which is activated by lid closure. This surveyor's compass clinometer by Hilger & Watts with its original stitched leather case, is in excellent condition. A nice example it's engraved on the reverse 'HILGER & WATTS Ltd' the company formed by the amalgamation of well-known instrument makers E. R. Watts and Son, Ltd., and Adam Hilger, Ltd. It has a black compass needle pivoting on a gemstone bearing above a decorative dial with 360 degree scale, and 16 intercardinal points. It also incorporates a pendulous arm for measuring angle of slope in inches per yard. Dating to the mid 20th century it measures 3" in diameter, and is in full working order including the transit lock which is activated by a knurled knob on the side. This mid 19th century pocket compass is set in a hinged mahogany block and has a shapely blued-steel needle engraved N & S for clarity, with a paper dial divided into degrees. Although unsigned, as many 19th century wood block compasses are, the concealed hinges were a feature almost exclusively used by Francis Barker, and the quality is certainly in keeping with that makers reputation. Fastened with an attractive 7 shaped brass clasp, this is a nice clean compass, with both crystal and dial in fine order, and a working transit lock activated by lid closure. Measuring 65mm square, it is in full working order, and very good cosmetic condition, a classic Victorian compass with a traditional dial design. This is an elegant 19th century brass cased explorers or travellers compass with a traditional dial, denoting 16 cardinal and inter cardinal points, under a clean crystal. The blued steel needle has N & S lettering for clarity, and the brass case is in very good condition, with no dents. Dating to around 1860 it's unsigned but is clearly an antique compass of some quality, with a clean paper dial except for one small age stain around the SE point, and has its original push fit brass lid. In full working order, the dimensions are 45mm diameter and 11mm deep. 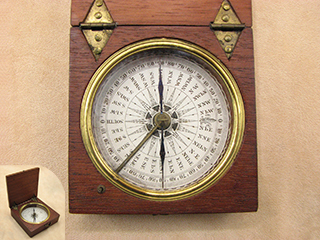 An Edwardian pocket compass set in what appears to be an oak case, with two elegant scroll shaped brass fasteners. The clean paper dial has a 360 degree graduated scale for compass readings, with 8 main cardinal points, and probably made in England for export as the dial pattern is French, note the 'O' (Ouest) for West. This compass is in very good condition as can be seen by the photos, and measures 70mm square & 20mm deep. A nice clean compass, dating to the first quarter of the 20th century, and fully functional with a lid activated transit lock. Not only is this Glauser MK 4 a rare compass, but it's also in excellent condition and comes complete with its leather case & most of the original service kit. The kit comprises of a 1/2 oz bottle of liquid (empty), disc spanner, sighting wire, chamois leather & instruction sheet, the spare interchangeable pivot being the only item missing. Designed in the 1950's as a special project, it featured the facility to trap any bubbles inside a double casing that could be easily topped up with liquid, and an easily replaced pivot, which also made it possible for it to be serviced by the owner instead of having to send it back to the manufacturer. It comes with mother of pearl dial divided into degreees with an accuracy of +/- 1/2 degree, and is in exceptional cosmetic condition, even the luminous points are still active. Although designed by J M Glauser, it appears from the instruction sheet that Henry Browne & Son were the sole manufacturers, which suggests that this may have been after 1956 when Jean Maurice Glauser retired. A precision compass in full working order with no bubbles in the alcohol liquid, and of brass construction, it has a substantial feel to it weighing 11oz without its case. An excellent condition WW1 British Army Officers MK VI pocket compass, engraved W. F. Holmes, Birmingham VI 44198, 1918, with the military arrow denoting War department issue, also stamped on the lid. The polished full hunter case is free of any dents and retains all its original nickel plating, with a bevelled glass crystal covering an attractive jewelled bearing floating dial, which has all its original dial markings intact. In full working order, with a strong hinge and a working transit lock, it measures 45mm in diameter not including the stem, a fine example of these iconic compasses. A nice example of a WW1 British Army Officers MK V pocket watch compass, engraved on the lid 'Short & Mason Ltd, London, 1916, V, 84271', and military arrow. The hunter case is in very good condition and retains all its nickel plating both inside and out. It has a bevelled glass crystal covering the distinctive Singers patent style black & white floating dial, which is mounted on a jewelled brass bearing for reduced friction on the pivot point. In full working order, with strong hinge including the transit lock, this is a fine working example from one of the more renowned instrument makers of the time. Dating to the first half of the 19th century (circa 1850), this brass cased pocket compass measures 75mm in diameter and stands 35mm high. Although there is no lid, it does have the advantage of a removable crystal within a brass bezel, which means it can be easily kept clean. The attractive card dial is in good cosmetic condition and the brass case is also free from any dents or gouges with wear consistent with its age. Unsigned, but in full working order. This is a fine example of an early 19th century mariners compass mounted on gimbals in an oak case with a later replacement sliding lid. In good condition, it measures 5" (130mm) square & 4" (100mm) in height, with the compass bowl being 80mm in diameter, making it a smaller than usual and therefore not so common. The compass floating card dial pivots on a gemstone bearing, and is set within a brass bowl which is free of any knocks or dents and retains all its original lacquer. The oak case has early dovetail joints and is generally in sound condition although the base has a large ink stain, probably happened in rough seas! There is also a faded label on the front where the words Mariners Compass can just be made out. Dating to circa 1840, this is a robust little compass weighing just over 600 grams and is in full working order with a clean dial and glass crystal. A small 19th century brass cased pocket compass circa 1840, with a distinctive floating dial pivoting on a gemstone bearing. Although there is no makers name, the card dial is in very good legible condition and is housed under a clean glass crystal. The brass case is also in good condition, free of any dents, and has its original push on protective brass lid. This is a relatively rare prismatic marching compass engraved 'BARKERS PATENT, PAT No: 29677, 1910' and was produced as an alternative to the more popular Verner's pattern models which were the mainstay of the British Army during WW1. Whilst there are no real shortages of the WW1 Verner’s pattern compasses, numbers of the Barker's patent models are very much less. The clean central dial is aluminium with an outer 360 degree scale on a transparent rim, and as can be seen from the photos the compass body is in good condition with minimal loss of its black finish on the lid, and a clean undamaged glass crystal. The only blemish is that it no longer has the rubber anti slip ring on the base underside, but this doesn't affect the function as it's in full working order. A rare compass from the WW1 era, it comes with its original leather carrying case which although lightly scuffed in places is very sound with all its stitching intact. 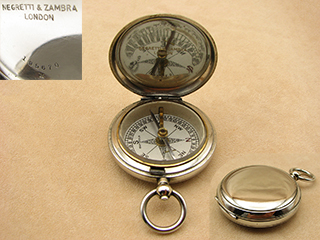 An attractive late Victorian pocket compass set in a leather covered outer case measuring 40mm in diameter, it has a label inside the lid which reads 'A. Franks, Optician, Manchester, Liverpool & Hull'. This is Aubrey Franks who belonged to the famous Franks family founded in the late 18th century by Isaac Franks. The firm operated in Manchester from 1798 and continued as a family business throughout the 19th & 20th centuries with Aubrey taking it over in 1878. The firm operated under the Franks name until 1950, when it was finally acquired by Dollond & Aitchison. The elegant blued steel needle is impressed 'N' & 'S' in gold lettering & sits over a clean paper compass dial incorporating 16 cardinal & intercardinal points with a fleur de lys for North. The compass glass crystal is protected by a blue velvet lining on the case lid, which is fastened by an ornate brass clasp. In good working order, the cosmetic condition of both compass & outer case is good, although the case is a little on the delicate side. This is a J H Steward Verners Pattern MK VII prismatic marching compass signed J. H. STEWARD LONDON on the lid. The MK VII was introduced in to the British Army just before WW1, and although this example doersn't have a serial number it does have the military arrow which suggests it was issued very early in or prior to WW1. Still retaining virtually all of its black finish on the lid, the Mother of Pearl dial and glass covers are in very good condition, and the base still has its original rubber anti slip ring. In full working order with a manual transit lock, a nice complete example from WW1 which comes with a good condition Sam Browne leather case for attaching to a belt. A fine example of a 1918 British Army Officers MK VI pocket compass by Clement Clarke, a British optician established in 1917, so made relatively few of these compasses during WW1. Housed in a full hunter case which is in excellent dent free condition, it retains all its nickel plating both inside and out, and is engraved 'CLEMENT CLARKE LTD, LONDON, VI , 35783 1918' on the lid along with the military arrow, although the markings are quite worn but still readable. Despite this the compass is in excellent cosmetic condition as can be seen from the photos, and the thick bevelled glass crystal covers the clean aluminium dial, mounted on a jewelled brass bearing for reduced friction on the pivot point. A quality brass cased Victorian compass with a separate brass lid, by Francis Barker & Son London. The blued steel needle with gold letters pivots above an attractive sunburst dial and is covered by a clean undamaged crystal. The paper dial has the F Barker and Son logo, within the trademark London triangle just under the North cardinal point and dates to the latter part of the 19th century. A small example measuring just 30mm in diameter, it's a nice antique compass in very good condition with no dents and a snug fitting lid, in full working order. This black lacquered brass trough compass, was made by Francis Barker & Son for use by the British Military during WW1, and is engraved 'F.BARKER & SON, LONDON, II, No. 9571, 1916' on the side. Not used as a traditional compass and known also as a plane table compass, it was used by surveyors to establish the direction of magnetic North when aligning a plane table or theodolite. The needle of the compass consists of a long narrow magnetised bar of steel, pointed at both ends, with the usual agate bearing at its centre. It is mounted in a narrow rectangular box carrying a pivot at its centre, and is housed in a mahogany case with a sliding lid that activates a transit lock for when the instrument is not in use. Measuring 168mm x 40mm x 28mm in its wooden case, it weighs just over 0.3kgs and is in good working order as well as excellent cosmetic condition. One of the rarer examples of a WW1 British Army Officers pocket watch compass, engraved Terrasse. W. Co. VI 87567, 1918, along with the military arrow. The nickel plated case is in good condition, although the plating is a little rubbed in places on the outside surfaces and more so on the underside as can be seen in the larger photos, but is completely intact inside the lid. It has a bevelled glass crystal covering the attractive jewelled pivot floating aluminium dial which is in very good condition, retaining all its original markings. In full working order, with strong hinge including the transit lock. A fine working example from one of the lesser known makers of this style of compass. Measures 45mm in diameter. Although this mahogany cased pocket compass is named and dated June 1902 by a previous owner, it was made a little earlier in the late Victorian period, sometime during the 1880's. The distinctive paper dial has 16 cardinal points and an outer scale calibrated in 2 degree increments in four 90 degree quadrants. In excellent cosmetic condition, direction is indicated by an English cross bar needle which pivots on a jewelled bearing under a clean undamaged crystal. Measuring 67mm square, the lid is skilfully hand engraved 'Thomas R Midgley, June 1902' and is fastened with two '7' shaped brass clasps. This is a stylish antique compass in full working order, including the original transit lock activated by lid closure. This mid 19th century small boat compass consists of a bowl and gimbal ring made of a lacquered brass construction, and housed in its original oak box with sliding lid. The traditional card dial pivots on a gemstone bearing, has 32 cardinal & inter cardinal points, with an outer scale of four 90 degree quadrants. An unsigned piece which is complete, and in excellent cosmetic condition throughout, the box dimensions are 5" square by 4" high, with a compass bowl diameter of 3". Weighing just over 700 grams, it's not only in good working order, but also a nice decorative antique which displays very well. This is a fine example of a 1917 British Army Officers full hunter cased pocket compass from WW1. It's engraved 'F Barker & Son London, 1917, VI, 19866' on the underside of the case, and the lid has the numbers 128693M on the inside. The nickel plated hunter case is in very good dent free condition with all its plating intact, and it has a bevelled glass crystal covering the floating dial which pivots on a red gemstone bearing for reduced friction. A fine military compass by Francis Barker, who was probably the most prolific compass maker in history, it's in very good condition, and in full working order, including the automatic transit lock. It measures 45mm diameter. This small brass pocket compass engraved 'LENNIE EDINBURGH' inside the lid dates to the latter part of the 19th century, circa 1880's. Although measuring only 35mm diameter, this is quite a striking little compass with a black & white Singers patent style card dial pivoting on a gemstone bearing. The dial also has the word ENGLAND on it which suggests that Lennie didn't manufacture the compass but bought it on a wholesale basis, probably from Francis Barker, and rebranded it. It has a gunmetal finish both inside & outside the hunter case which is pretty much complete, although there is some minor loss inside the lid. A compact compass, of good quality which is in full working order including the transit lock. As can be seen from the photos it is in good condition with minimal loss of its black finish on the lid, and a clean undamaged glass crystal under which the card dial retains all its markings. A rare compass in full working order, there is also a manual transit lock. A full hunter cased pocket compass with a Verners style aluminium dial which pivots on a red gemstone bearing, under a clean glass crystal. The case is of blackened brass construction and is in almost mint condition with virtually no paint loss or any dents. Signed 'Sherwood London' on the clean dial, it's a non prismatic model dating to the post WW1 period and is in full working order. In excellent all round condition, it measures 55mm diameter and 18mm depth, and incorporates a transit lock activated on lid closure. This WW1 Verner's pattern MKVIII prismatic marching compass is made by Sampson Mordan, and is engraved 'S. Mordan & Co, 102376, 1918', it's also stamped with the British Army War department arrow on the underside of the compass body. It has the original owners details hand scribed on the compass body, and reads 'J GARNER LT 7 no SHER FOR'. This refers to a Lieutenant J Garner of the 7th (Robin Hood) Battalion Sherwood Foresters, who served from 1914 - 1920 and was awarded the British war medal & Victory medal. In very good condition all round, with a jewelled bearing Mother of Pearl dial, the brass case has a nice age patination, and there is a transit lock activated by lid closure. It still has its anti slip rubber ring on the underside, so often missing on these compasses, and comes with its original leather case also dated 1918, which is also in very good condition with all stitching intact. 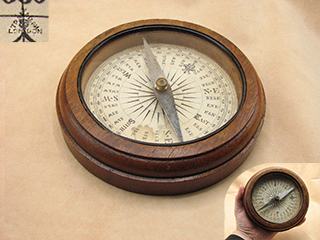 An impressive Edwardian mahogany cased desk top compass measuring 6.5" in diameter, these compasses were made by Francis Barker & Son both for their direct sales, with the unsigned examples as this one is, supplied for wholesale supply. Dating to around 1910, this mahogany cased compass was probably intended for use as an impressive desk ornament, a purpose it would still fulfil today. The large steel needle measures 4.5" in length, is in clean condition with no oxidisation and pivots on a gemstone bearing (North denoted by the bright steel section). The cosmetic condition is very good with no splits or cracks on the wood, and an undamaged glass crystal. In good working order an antique compass with rare novelty value. This black lacquered brass, green card prismatic compass was made by Elliott Bros and is printed 'ELLIOTT BROS, STRAND, LONDON' on the dial around the pivot. The founder William Elliott formed a partnership with his sons Frederick & Charles in 1850, and the firm became known as Elliott & Sons. However, the name was changed to Elliott Bros from 1854 after William retired in 1853. It measures 70mm diameter, and has a folding front sight which also locks the compass card for transit, and a prism that locks down by means of a brass strap. The compass body also has the name of the original owner 'F. J. DeLisle.' engraved in a flowing script, along with his initials F.J.D. impressed on the original leather case. My research indicates that this was Frederick J DeLisle, a Lieutenant in the 8th Battery Brigade in South Africa during the Zulu wars of 1879 and is recorded in the UK Military award Rolls as receiving a campaign medal for actively engaging against the Zulus. In good working order this is a relatively rare example in very good condition, from one of the more renowned makers of the 19th century, and with an interesting military provenance. A very elegant brass cased explorer’s style compass with a separate push fit lid probably made around 1880 by Francis Barker & Son on a wholesale basis, so unsigned. The stylish English cross bar needle pivots on a jewelled bearing above a traditional dial, denoting 32 cardinal and inter cardinal points, under a clean undamaged crystal. Housed in a lacqured brass case with minor some lacquer loss as can be seen in the photos, it is free of any dents and has some numbers which appear to read 18/6 scratched on the underside, which may have been some kind of index number. This is a very clean antique compass of high quality, with its original glass crystal which is free of any chips or damage. In full working order, including a transit lock activated when lid is in place, the dimensions are 60mm diameter and 18mm deep. This is a 1970's prismatic liquid filled prismatic compass in superb cosmetic condition and engraved 'Enbeeco, Made in England' on the reverse, which is a brand name of Newbold & Bulford Co Ltd. It has a degrees dial, and although is similar in design to the Francis Barker M88, the maker is not so well known but the compass is still a quality precision instrument which compares well with the M88, and is a good alternative for a lower budget. The body is constructed from an aluminium alloy which is slightly heavier than the M88 at 133 grams, and comes in its original leather case. As can be seen from the photos the condition is exceptional showing very little signs of use, and is in full working order with the liquid damping effect giving precise readings very quickly. This is a WW2 full hunter cased British Army Officers pocket compass, engraved 'MK VI 1940, F Barker &Son (1932) Ltd, London, B 5237' on the lid and also has the War department military arrow, which shows it was issued to the field. As can be seen from the photos, its in really good condition, and in full working order, with a strong hinge, including the transit lock. A nice example of a Hunter cased pocket compass by Francis Barker, which dates to the early part of the 20th century, and quite similar in style to the WW1 British Army Officers compasses. Fitted with an English cross bar needle that pivots on an agate gemstone, above an attractive frosted aluminium dial on which is printed 'F Barker & Son, Makers London '. A super compass measuring 45mm in diameter, it's in good working order including the lid activated transit lock, and the clean glass crystal is chip free. A very collectable compass by probably the most prolific of all of compass makers. A stunning early Victorian gilded brass pocket compass set in a red silk & velvet lined leather case, this is a particularly rare example made by the celebrated Manchester optician John Benjamin Dancer, son of Josiah dancer whose business he inherited in 1835. As can be seen from the photos it's in exceptional condition, and the English cross bar needle pivots on a red gemstone bearing for reduced friction, above a white enamel dial with 16 cardinal & inter cardinal points, protected by a slightly domed glass crystal. Dating to circa 1845, it comes fitted in a Moroccan leather case which is in good sound condition and retains its ornate brass fastening clasp. Measuring 35mm in diameter not including the bow, this elegant compass is in working order including the transit lock, activated by a lever behind the compass stem and finds North easily, settling quickly. Housed in a bright nickel plated full hunter case with its distinctive Singers style dial, it’s in full working order including the lid activated transit lock, and the crystal is free from any chips. The lid flips open by depressing the push button on the crown, and snaps shut with a positive click as it should. This is a WW1 Verner's pattern MKVIII prismatic marching compass dated 1917. Engraved E. R. Watts & Son, London with serial no 73633, it's also stamped with the British Army War department arrow on the underside of the compass body. It still has its anti slip rubber ring on the underside, which is so often missing on these compasses, and comes with a leather case which is also in very good condition with all stitching intact. A nice example of a WW1 military marching compass by J Wardale London, dated 1918 and numbered 6269, the majority of these compasses were made out of wood toward the end of WW1 when brass was becoming very scarce, due to its extensive use in munitions. Set in a mahogany block measuring 3" square, with a Verner's design dial card under a rotating glass crystal, it's in good original condition with very little cosmetic wear and tear. In good working order throughout, the base is engraved 'J WARDALE & Co, LONDON, 1918 no 6269' and there is a small military arrow engraved in one corner, showing it to have been issued in to service. This is an impressive 19th century brass cased pocket compass circa 1830, with a separate push on lid. It has a shapely blued-steel needle engraved N & S for clarity, with a clean paper dial divided into degrees and also showing all the points of the compass. Although unsigned, this is a nice clean compass, with both crystal and dial in fine order, and a working transit lock activated by lid closure. Measuring 60mm in diameter, it is in full working order, and excellent cosmetic condition, a classic Georgian compass with a traditional dial design. This large Victorian mahogany cased desk top compass measures 7.5" (190mm) square, with a dial diameter of 6.25" (160mm)and made during the last quarter of the 19th century in London, for use as an educational aid in schools. The School boards were abolished in 1902 and replaced by Local education Authorities. Not only a very impressive compass in good working order, but also quite a rare item which is part of social history. In great condition, North is a fleur-de-lis and there are no fewer than 32 Cardinal & inter cardinal points plus an outer scale with four 90 degree quadrants. Made by Short & Mason and engraved on the lid 'Short & Mason Ltd, London, V, 1910, 2981', it also has the military arrow, showing that it was issued into service. The hunter case is in very good condition with only one or two very minor dings and retains all its nickel plating both inside and out. In full working order, with a functioning transit lock and strong hinge, it measures 45mm in diameter, not including the stem. A rare pocket compass, with a classic black & white Singers patent design on a Mother of Pearl dial, housed in a gilded brass case. Although unsigned this is a quality piece dating to the latter part of the 19th century circa 1880, and in very good condition as can be seen from the photos. The clean dial pivots on a gemstone bearing and is set under a clean undamaged bevelled crystal. In good working order, with a functioning transit lock activated by a push button on the stem, this is an impressive compass in very good condition, and measures 42mm diameter not including the bow. It comes with a modern gold plated albert style chain, and will be sent in a plush gift box. This is a British Army WW1 Officers pocket watch style compass, engraved C Haseler & Son Ltd, Birmingham VI 127112 1917, along with the War Department military arrow on the lid. The engraving is quite shallow and difficult to photograph, but is easily read by eye when held in the hand. It has its original bevelled glass crystal which is in fine condition, and covers an attractive jewelled pivot floating dial with most of its markings intact, save for some minor paint loss on the tip of the North arrow. The full hunter case is in very good condition, retaining all its original nickel plating with no dents, and the compass is in full working order, including the automatic transit lock. Measuring 45mm diameter on the main body, it's a fine example of these charismatic WW1 compasses, which are becoming increasingly scarce. 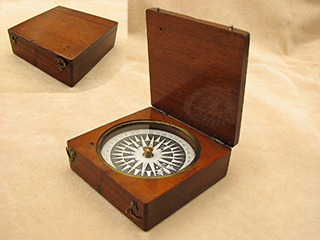 This is a very elegant mid 19th century pocket compass circa 1870, set in a hinged mahogany block 65mm square. It has a shapely blued-steel needle engraved N & S in gold lettering, pivoting over a clean paper dial divided into degrees and also showing all the points of the compass. The needle is held by a detent which comes into play when the lid is closed. The compass dial has the makers name 'YEATES & SON, DUBLIN', who succeeded George Yeates & Son in 1865. Fastened with an attractive 7 shaped brass clasp, this is a nice clean compass, with both crystal and dial in clean condition. In very good condition and in full working order, it finds North well, this is a classic Victorian compass with a traditional dial design. With so many reproduction instruments bearing the name Stanley London on the internet, its a rare treat to find one of the few genuine items, and this particular compass is a fine example to admire. Dating to the latter part of the 19th century, it's constructed from brass with an English cross bar needle which pivots above a distinctive dial, engraved 'STANLEY LONDON', and covered by the original crystal in clean undamaged condition. It has a separate push on lid for protecting the glass crystal, which also activates a transit lock for locking the needle when in place. A quality Victorian piece with a traditional printed paper dial denoting 16 cardinal and inter cardinal points, it's in very good condition all round, no dents, and the paper dial is complete without any tears. A fully working antique compass measuring 47mm in diameter. An impressive example of an early Georgian mariners pocket compass dating between 1820 & 1830. 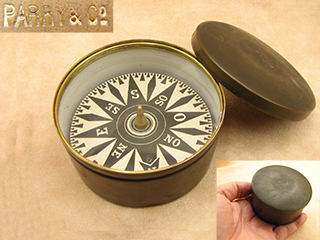 Housed in a brass case with lid, it comes with its original sepearate velvet lined papier mache outer case, so often missing on these compasses. Although unsigned the distinctive floating card dial is of a particularly early design and is still surprisingly clean, although there is some minor fading only visible on close inspection. In very good condition all round including the outer case, it still has the original glass crystal and there are no dents in the brass case or lid. In good working order, it measures 50mm diameter in its brass case, with the outer case being 60mm in diameter. A British Army WW1 Verner's Pattern MKVII prismatic marching compass with leather case and carry strap, all in very good condition. Engraved '1915 Ed KOEHN GENEVA SWITZERLAND no 21754'on the base, and also the War department military arrow. The leather case is embossed J B Brooks & Co Ltd 1915, and is likely to be the original case given they share the same date. In full working order, a nice complete example from WW1. This is a fine and rare example of a MK VI prismatic marching compass which was superceeded by the more common MK VII shortly after the start of WW1. The MK VI is much less common and unusual to find in such good condition, still having all its black paint finish on the lid. It dates to around 1910, made by Francis Barker, and engraved 'Francis Barker & Son, Makers, London' on the reverse, plus it still has its original anti slip rubber ring. In very good cosmetic condition, it has the mother of pearl dial for low light readings, and is in full working order. The accompanying stitched leather case is also in good, sound condition, and has the remains of a paper label which appers to read 'FORBES D C HAYMKT EDIN.' which presumably refers to a previous owner with a connection to the Haymarket area of Edinburgh. There are also some ink written letters on the case but not easy to identify, see photos. Originally designed by a Canadian geologist named D W Brunton in the late 19th century, the Brunton compass is still very much the first choice of many geologists for field mapping of geological objects. Whilst there are many reproductions of this design of compass, this particular example is the genuine article made by Hilger & Watts, the company formed by the amalgamation of well-known instrument makers E. R. Watts and Son, Ltd., and Adam Hilger, Ltd. Mainly constructed from aluminium, it's a substantial yet precision instrument, which weighs just over 350 grams, and measures 80mm across its widest point. This is an impressive Georgian mahogany cased pocket compass measuring 80mm square. The attractive paper compass dial is of a particularly early design, graduated in 90 degree quadrants and dates to the first quarter of the 19th century circa 1820. Complimented by the small triangular hand made hinges and a plain blued steel needle, this is a stylish antique compass which is approaching 200 years old. It's quite rare to find compasses of this age in such good condition, and it's in full working order including the original transit lock activated by lid closure. A fine example of a late 18th or early 19th century brass cased pocket compass circa 1800. Although unsigned the sunburst design of the dial and blued steel needle with the triangular brass cap bearing indicates that this is an early compass. The brass case is in very good condition with no dents and unusually has a screw on domed lid instead of the more common push on type. In good working order with its original glass crystal and clean dial, it measures 42mm in diameter and 15mm deep including the lid. This is a large prismatic artillery compass, made by E. R. Watts & Son London, during the 1920's. It really is an impressive instrument measuring 125mm in diameter and incorporates a number of features not found on the more standard models, including two rotating sun filters on the prism, with an adjustable folding mirror on the back sight. A substantial instrument weighing over 800 grams, there is also a threaded boss on the underside of the base for attaching to a tripod. In full working order including the automatic transit lock, not only is this a very collectable compass but also still practical for use today. 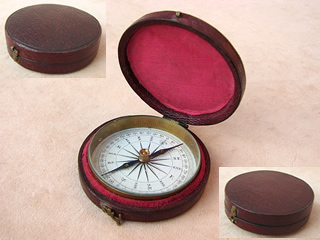 This is a very elegant mid 19th century pocket compass circa 1865, set in a hinged mahogany block. It has a shapely blued steel needle engraved N & S in gold lettering, with a clean paper dial divided into four quadrants of 90 degrees, and also showing all the points of the compass. Although impressed 'Lennie 46 Princes St Edinburgh' inside the lid, the concealed hinges were a feature almost exclusively used by Francis Barker, and its very likely this was made by Barker for rebranding by Lennie who traded from the 46 Princes St address from 1857. Fastened with an attractive 7 shaped brass clasp, this is a nice clean compass, with both crystal and dial in fine order, and a working transit lock. Measuring 45mm square, it's in full working order, and in excellent cosmetic condition with an attractive darker patination of the case exterior, a classic Victorian compass with a traditional dial design. A small but impressive mid Victorian dial card pocket compass, set in a hinged mahogany block 41mm square with an attractive fleur de lis for North, and a clean paper dial divided into four quadrants of 90degrees around its circumference. The dial card is signed 'NEGRETTI & ZAMBRA LONDON' in a circle around the centre pivot which has a gemstone bearing for reduced friction, and is held by a transit lock activated when the lid is closed. Fastened with an attractive 7 shaped brass clasp, both crystal and dial are also in fine order. In full working order, a real classic with a traditional design by a well respected maker, circa 1870. Housed in a lacqured brass case which does have some lacquer loss on its underside as can be seen in the photos, it is free of any dents or deformities. This is an antique compass of high quality, by the most renowned of all compass makers and comes in a leather carry case from the same period. In full working order, including a transit lock activated when lid is in place, the dimensions are 70mm diameter and 18mm deep. A small pocket compass, in superb condition which has a classic black &white Singers patent design on a Mother of Pearl dial, housed in a full hunter case. Dating to circa 1880, this is a quality item made by Negretti & Zambra, and is signed 'NEGRETTI & ZAMBRA, LONDON' on the dial. The clean dial pivots on a gemstone bearing and is set under a damage free bevelled crystal, encased within its nickel plated case which is in dent free condition, and retains all its nickel plating. In good working order, with a functioning transit lock and strong hinge, this is quite a rare compass from one of the most renowned instrument makers of the 19th century, measuring 38mm diameter not including the bow. A very attractive 19th century brass cased explorers compass with a push fit lid that unusually carries a very decorative personalised inscription reading ' I B Browne from J C C , DECR 25th 1895 '. Clearly a special Christmas gift for someone, but I suspect the compass is actually earlier than the inscribed date, as this distinctive dial design spans several decades from before the mid 19th century. Although unsigned this is clearly a quality pocket compass in very good condition, the brass case & lid retaining virtually all of their original lacquer and measures 80mm in diameter. Measuring 80mm in diameter, it's in good working order and also has a a built in transit lock which is activated when the brass lid is in place. This is a very elegant 19th century dial card pocket compass, dating to around 1875. The distinctive black & white dial has 8 cardinal & intercardinal points, along with outer graduations in one degree increments, and is housed under a clear domed crystal. Set in a black leather covered case with green velvet lining, and fastened with an ornate brass clasp, this is a fine antique compass from the mid Victorian period which is in very good cosmetic condition. In good working order the compass measures 45mm diameter, and the outer case just under 55mm. A distinctive late Victorian brass cased travellers pocket compass dating to around 1890. The silvered compass dial has 8 cardinal points and an outer scale calibrated in 1degree increments in four 90 degree quadrants. Direction is indicated by an English cross bar needle which pivots on a jewelled bearing under a clean undamaged crystal. The brass case is in very good polished condition free of any dents, with a brass lid for protecting the glass crystal and engaging the built in transit lock. In full working order, the dimensions are 70mm diameter and 18mm deep. A stylish example of a 19th century brass cased pocket compass with an English cross bar needle on a jewelled pivot, and signed 'Lennie Opticians Edinburgh', on the lid. However, I believe this was the retailer who purchased the compass on a wholesale basis from one of the main compass makers of the time, which was very likely Francis Barker. Dating to around 1890, its in good clean condition with a clear, and undamaged crystal over a frosted aluminium dial. The black finished brass case is also in good condition retaining virtually all its original finish, and is dent free. Measuring 45mm diameter and 15mm thick, this is a sturdy yet attractive compass in full working order, including the automatic transit lock.